One lie. A little one. Intended to answer the question “How are you?” in the expected way. Well meaning. Until you develop a chronic illness like hypothyroidism. Then those three little words become way too big to handle. 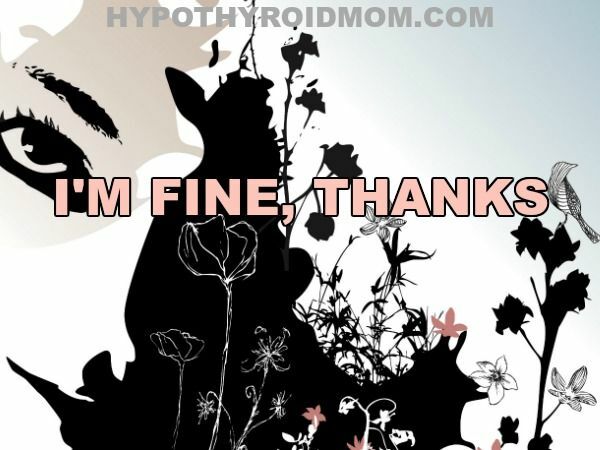 When hypothyroidism hits you, the fatigue is so deep that there are no words to describe it. Thyroid tired. Boy, if only people knew, but do you really want to hear that? Everyone tells me to eat less and exercise more. It’s BS. I never had weight issues before hypothyroidism. The fat starts spilling up over my damn jeans as I zip them up, but do you really want to hear that? The shower drain keeps clogging up with the mounds of hair falling off the top of my head. The skin of my scalp is starting to show through and I’m devastated that I could be going bald, but do you really want to hear that? What happened to me? Where did I go? It’s like I’m watching the life of a completely different person. Like I’m another person watching me, but this unfamiliar, unhealthy person that I don’t recognize, but do you really want to hear that? I walk by a mirror and take a double take. Is that my face? That can’t be my face. A haggard face with dark, baggy circles under the eyes that seems to have aged 10 years in the span of a few months looks back at me. I’m aging at an accelerated pace now. I feel ugly, but do you really want to hear that? I’m losing friends. I’m losing family. Chronic illness has a way of changing our closest relationships. I hear the whispers. What happened to her? She used to be so much fun? Now all she does is sleep. People who used to love my company are distancing themselves. They’ve stopped inviting me places and get angry when I cancel on them. I’m losing friends and family, but do you really want to hear that? Hypothyroidism affects every part of the body and rapidly new symptoms arise. New medical diagnoses are given and medications are added. Cholesterol levels and blood sugar are rising and doctors look worried. No one seems to be able to help me, not even my doctors. When I was a little girl, I thought doctors were like super heros swooping in just in the nick of time to save you from whatever ails you, but I was wrong, but do you really want to hear that? No body part is safe from hypothyroidism and that includes our brains. Anxiety. Depression. Panic. Mood swings. I have no idea how to explain how brutal it is when your brain seems to shift, especially at night. Every single worry you’ve ever had in your life keeps playing over and over on continual freakin’ rewind all through your sleepless night, but do you really want to hear that? When I was pregnant with my first son I had dreams of being a super mom. I was definitely going to be the perfect mom that balanced work, life, and parenting with perfection, but then reality came crashing down. I developed hypothyroidism and I couldn’t keep up like others mothers. I just couldn’t. I feel like a failure as a mother, but do you really want to hear that? I was always an overachieving employee determined to rise through the ranks of the corporate world. I was confident in my abilities and never doubted that I would rise, rise high in my career. But now I’m screwing up big time at work, missing deadlines, and forgetting important details. I’m not getting the raises and promotions that I would normally receive and I fear being fired, but do you really want to hear that? She’s become so lazy. That’s what they say and I’m starting to believe it myself. I don’t have the energy to do the normal things everyone does and people make me feel so bad about it. Just get up and move everyone keeps saying. They don’t understand and I feel alone, but do you really want to hear that? I never expected to be sick. I never expected to have a chronic illness. I never expected to change. I never wanted to change. I hate being sick, but do you really want to hear that? Come on snap out of it. Just get out more. Just stop worrying. Just think on the bright side. Just…just…just. Yeah just shove it because I’m losing it and your insensitive and utterly uninformed suggestions make me feel like this is my fault. My fault that I got sick. This is a disease. It happens to hundreds of thousands of people. It’s real. It’s not all in my head. I will find my perfect health again. I will. There is no stopping me, but for now please just believe me. Just love me. Just be there without judgment. But do you really want to hear that? this is all complexly true! ive had this condition for years, ive never felt well, but try to put a good face on it. It feels as though no one understands, and the worst bit is, when you go to the doctor, they just look, and say try harder!!! I now have heart disease, and put it down to the fact that I was started off with 100 mcgs thyroxine, which I now know was wrong, sigh, why don’t the doctors get trained properly on the thyroid issues?i fail to comprehend! ..My face is puffy, I m a yo yo… I lose weight, I gain weight. ..Not to mention the lack of sleep, lately I have been sleeping like a new born sleep a min wake up… Im just drain but Im going to fight a good fight. You need to find a different doctor. Find one that will treat you, not your labs!!! I have had this for 32 years. When I see doctors for the first time,I give them 2 chances. On the second visit if they do not talk to me instead of the labs in my chart, I look for another endocrinologist. Not easy but I am better satisfied. When people say that you just want attention and to stand out. But all you want to do is crawl away somewhere and hide/sleep/get out of the limelight someone put you in. When people tell you that your food allergies/sensitivities/intolerances are all in your mind or a fad – don’t you know that you have to eat normal food even though it makes you sick, just to please someone else. Sometimes I’m so embarrassed to be apart of this race. What we do to each other is terrible – and we are supposed to be the superior race. Animals are so much smarter than humans. Unfortunately, most physicians are now joining corporations or hospital groups (same difference, really) because it is getting too expensive to have a private practice and insurance companies reimburse pathetically poorly. They now are production-driven and can no longer spend proper and adequate time to actually listen. It’s like the psychiatrists who listen for 5 minutes, jump to a diagnosis and prescribe a drug. Hopefully, people will wake up, realize what’s going on and demand a change. Hopefully. When you can’t tolerate flashing lights at work, and they say “hmmmm … really? A medical condition?” And I’m trying to justify my sensitivity to an insensitive jerk. When you can’t swim in the pool because you are freezing and feel like you are being tortured and your friend says it’s all in your head. I. Want. To. SCREAM.